Reggae of the mid-1970s found an ally in the punk music community as both sonic landscapes featured a revolutionary, DIY spirit, a raised conscience against intolerance and injustice, and a sound that stripped away the bombast of reigning arena rock down a simpler, direct-hit-to-the-gut approach. While the Canyon Club in Agoura Hills, California- an enclave nestled between the high rent suburbia of Thousand Oaks and Calabasas, just north of Los Angeles- may seem an unlikely venue for Ziggy Marley to mine for political and social uprising, one would be hard pressed to find someone not moved, both literally and figuratively, by his near two-hour set. The energy and soul that emanated from the stage had the feel of a very special performance that crackled with intensity and intent. Deploying his eight-piece backing band and its razor sharp arrangements, Marley navigated a 19-song set that leaned heavily on his new Wild and Free record, a slight departure from his summer festival appearances, as his Forward to Love tour begins its year-long journey across the globe. Opening the evening with Welcome to the World, the capacity audience, ranging from tow-headed 12-year-olds to the middle-aged, bobbed and weaved, seemingly delighted to be seeing Marley in such an intimate setting. The staccato stop-start breaks in Road Less Traveled announced a more aggressive take than on record, culminating in an extended crescendo. In fact, this first couplet was a harbinger of the evening, with Marley’s song choices alternating between minor key and major key, but all more penetrating than their studio version brethren and all played up. Way up. A punky quickness inhabited even the more traditionally laid-back fare, including father Bob’s Stir it Up, the night’s first cover. 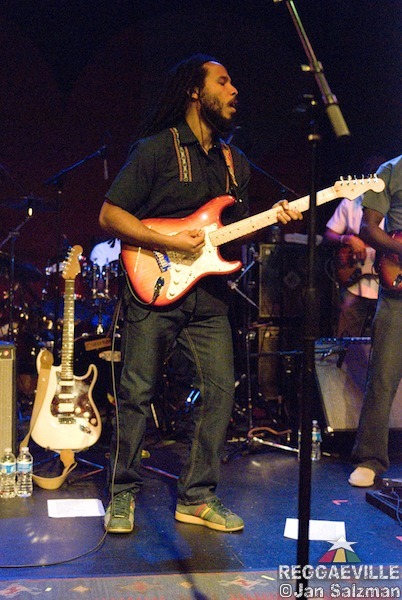 It was, in fact, seven songs into the concert before Marley, dressed in black button-down short sleeves, even spoke to the crowd, and that a quick check on the mood before launching Personal Revolution, a call to action enhanced by drummer Carlton ‘Santa’ Davis’ martial beat that ended in a moment of audience participation, one of the show’s many. With the chant, “I will find a way,” rumbling through the club, Marley implored his guests as part singer, part shaman. The middle trio of Reggae in My Head/Black Cat/Wild and Free certainly lightened the lyrical mood, but did not slow the momentum. Tempos on every offering snapped with energy and focus, often showcasing Marley’s now road-reliable band. Takeshi Akimoto’s guitar solos drew bursts of exuberance from the crowd, injecting a bite into the sun-and-sand cocktail. Brilliantly, Marley’s pre-encore run of Is This Love?, Love is My Religion, and Look Who’s Dancing encompassed not only four decades of reggae music evolution, but also paid homage to one of its greats, passed the torch to its present, and reminded the crowd of the joys of pogo-hopping as Marley exited the stage to the reggaeton outro of the closer. He returned, of course, to deliver an encore that began with Them Belly Full, a tune from the Wailers days that finds sadly just as much relevance in the current state of the world. Followed by Justice and Changes, another gem from the new album, Marley, one could guess, was playing a bit strategically here. From titles alone, it appears that this encore, and tour for that matter, is about the message. The 100-watt smile is still there, the grooves are still groovy, but Marley wants you to think. Positively, as always, but think. Jammin’ brought the requisite applause deserving of a classic, and the obligatory raising of the cell phone cameras and video to capture as much of the moment as tired arms would allow. Finally, Let Jah Will Be Done ended the party, with almost psychedelic washes building until Marley signaled its conclusion.